I was honored to represent environmental, nuclear, government and trucking whistleblower cases against workplace bullies. My courageous clients included Oak Ridge National Laboratory technician C.D. "Bud" Varnadore, who was in retaliation for raising concerns assigned a "home base" next to radioactive waste barrels and in a room contaminated with visible mercury. Bud Varnadore's sadistic authoritarian boss, ORNL Analytical Chemistry Division Director Dr. WILBUR DOTREY SHULTS, Ph.D., testified that "I always heard radiation was good for cancer patients." SHULTS defended the room assignments, stating he would "wash his hands in mercury" and "take a bath in mercury" if he could "protect [his] body openings." I was honored to represent seven Indian Probate Judges against the U.S Department of the Interior -- independent Administrative Law Judges who were harassed, intimidated and threatened with firing for resisting illegal pressures on their judicial independence. The judges were denied their fair day in court and denied an independent Administrative Law Judge to hear their case by the oxymoronic U.S. Merit Systems Protection Board during the first Bush Administration. The case was featured in the November 1991 ABA Journal cover story, and in a peer-reviewed scholarly article that I wrote for the ABA Judges' Journal. Workplace bullies are sociopaths. Current laws do not protect us. Local workplace bullies like former St. Augustine City Manager WILLIAM BARRY HARRISS and his progeny, including Sheriff DAVID SHOAR, are a stench in the nostrils of the Nation. It's time for them to go. We need free democratic labor unions to help employees to stand up to the bullies, miscreants like St. Johns County Administrator MICHAEL DAVID WANCHICK and St. Augustine Beach City Manager BRUCE MAX ROYLE. The VP of Finance constantly interrupts and actively prevents others from speaking in meetings. He scoffs when they share ideas/make suggestions. A Managing Director at a financial services firm publicly trashes another Director’s new strategy, tearing it apart without having the domain expertise to truly understand what she is saying. The lead software engineer makes snide remarks about the product development process during team meetings. He publicly denounces the marketing team too. What do these three have in common? They’re bullies. Bullies are scary, shocking, embarrassing and far too often tolerated in the workplace. Why? Because we don’t want to have to deal with them, we don’t want the attack, the conflict, the discomfort. So we either pretend they aren’t wreaking havoc or we grit our teeth and tolerate them. "Paul," the COO of consumer packaged goods company manages the VP Finance bully I mentioned above. During coaching Paul realized how he tolerates, and even allows, this unacceptable behavior. He lets inappropriate conduct occur in meetings – when Paul could stop the bully from constantly interrupting and preventing others from speaking. Paul must clarify what appropriate meeting etiquette specifically is, and ensure it is honored. He acts as a go-between when the bully refuses to interact with people he thinks are “stupid”– when Paul could make it clear to both parties that they need to work things out together. He holds his anger in and compromises his integrity – when Paul could just deal with this issue directly, modeling leadership for his team and showing them a safe, respectful, collaborative work environment is required at the company. He lets others vent to him about the bully — instead of creating an opportunity to let disgruntled parties communicate their grievances directly and interface with HR. We all avoid uncomfortable human relations issues sometimes… but what is the cost? Exorbitant--as we daily give our power away, compromise our integrity, and inadvertently teach our team that bullying is acceptable. The answers are mattering, safety, belonging. Once you uncover what a bully wants you can start to give it to them, to begin reducing what Seth Godin calls the tantrum cycle. We can also then help shift the bully from tension to empowerment. More on this below. Ask question #2 a few times, as often this is where what they really want is revealed. 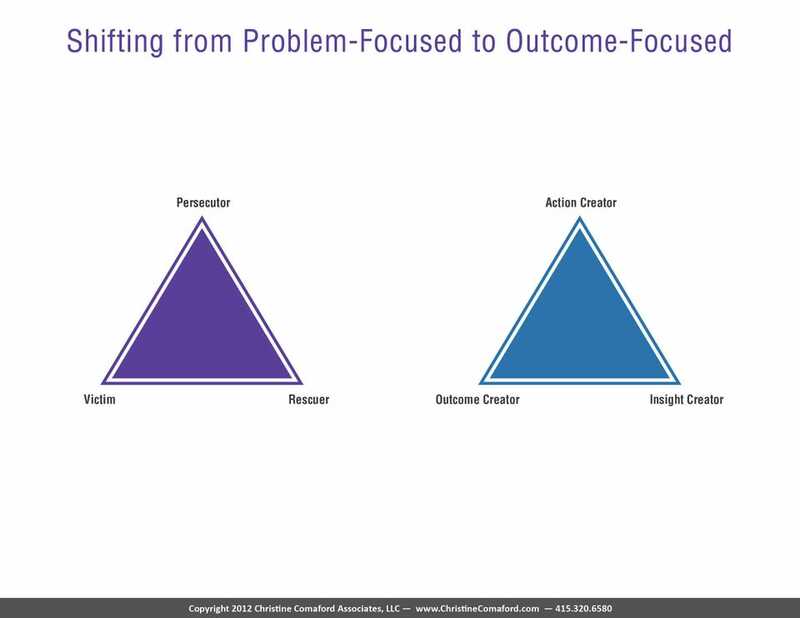 The Outcome Frame is a potent tool to get a person to focus on the outcome, and not the problem—it helps them get unstuck. Then you can shift to the right triangle above, where the victim/rescuer/persecutor have shifted to their positive alternative. Note that if the bully is above you on the org chart you’ll need a mentor equal or greater in stature to the bully to do the following. Check problem acknowledgement – do they agree that there is a problem? Do they agree this problem now must end? Co-create a plan – set a time period (30-60 days) where you’ll meet weekly for 15-30 minutes to track their progress on releasing the challenging behaviors identified above. Make the plan very specific in terms of what you need to see and when you’ll know you got the outcome you wanted (see Outcome Frame above). If the turnaround doesn’t occur, state clearly what the consequences will be (lose job, etc). Check understanding – is everything clear? Anything else we need to cover? Reiterate desire for a positive resolution so the consequences can become irrelevant. Build small agreements – launch the plan and commit to ending the conflict once and for all. Be sure to track it frequently and make sure all concerned see the behavior change too. I’m thrilled to report that the Managing Director and software engineer now play well with colleagues, and the VP Finance is in the turnaround process with positive momentum. Try the above and let me know how it goes! Christine Comaford (@comaford) is a neuroscience-based leadership and culture coach. She has built and sold 5 companies with 700% ROI using her potent brain-based techniques. Her current New York Times Bestseller is SmartTribes: How Teams Become Brilliant Together. Join Christine’s tribe for private resources, strategies, and invites to webinars.